During the entire month of May, I’ve been on a pasta binge. (I definitely need to begin my workout routine.) I’ve heard a lot of Emmy’s Spaghetti Shack over the last few years and I’ve been wanting to try it out. Verdict? Uber-hipster vibe with mediocre food. Located in the heart of the gritty Bernal Heights district, Emmy’s Spaghetti Shack packs a house full of young urban hipsters. It’s like a really dark dive bar that serves pasta. If you’re covered in tattoos with big hair and high heels, you’d fit in. If you don’t, this place reminds you of how terribly uncool you really are. Strike one – service was bad. I was standing at the front door for about 15 minutes before I became impatient and walked up to a server to tell her I wanted a table. She took my name on a notepad and told me the wait would be a half hour. Mind you the restaurant is the size of my bedroom. Tables were full, but there was no one else waiting to be seated. Five minutes after she took my name, a table opened up and she sat us down. The first thing they served us was dry, cold focaccia bread. That’s strike two. K and I got the spaghetti with meatballs ($12.95) and the oreccietti with peas and spinach in a light lemon cream sauce ($16.50). The pasta was unsatisfactory and completely overpriced – strike 3. 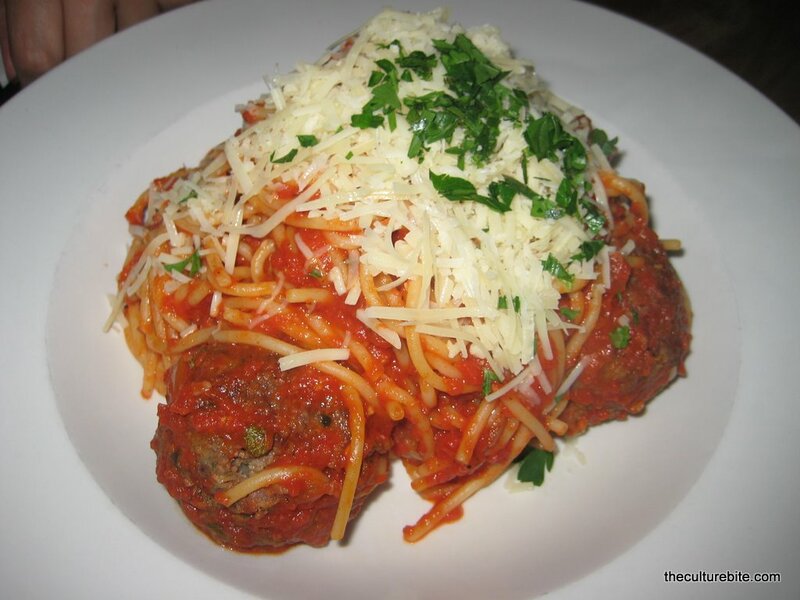 Spaghetti with Meatballs – As much as I wanted to like this spaghetti, I have to say my dad makes it better. The sauce was thick and tangy. A little dry and way too chunky for my liking. The meatballs were different, not bad. Huge meatballs loaded with tons of herbs and capers. Oreccietti with peas and spinach in a light lemon cream sauce – It sounded way better than it actually was. The sauce and al dente pasta were good, but it was completely ruined with the old , HARD peas. The peas weren’t fresh! Completely dissapointing. This requires a visit which we will do on our next trip to SF. Thank you. Thanks for the link! Have you tried oatmeal? That’s my dad’s secret ingredient.